They say the world is divided into dog lovers and cat lovers. 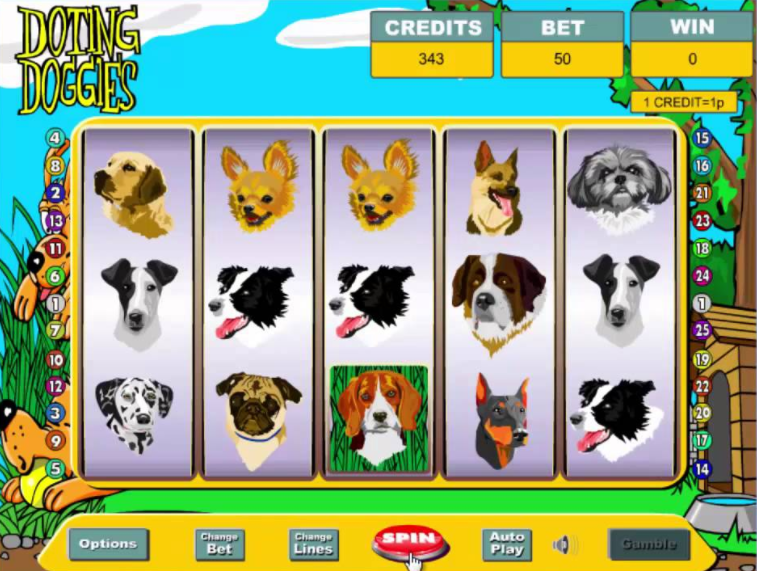 Doting Doggies online slot game is, of course, sure to delight fans of all things canine, though its vibrant style and moreish gameplay might convert even the most die-hard feline devotee. You’ll hit the woof with excitement at this pure-bred offering from Eyecon, which features an array of realistically-illustrated dog breeds, and a whole pack of bonus features. The dogs in this game are domesticated, but the winning opportunities are wild! WILDS – the Dog Bone WILD symbol substitutes for all other symbols apart from SCATTERS. SCATTERS – 3 or more SCATTERED Beagle symbols trigger 15 Free Spins, with tripled prizes. Free Spins can be retriggered, as well. GAMBLE – use this feature to bet and possibly multiply your wins by choosing a card suit or colour. Lines and bet can be altered easily using buttons below the reels, to customise the game to your liking. The Autoplay function allows you to set a number of auto spins, if you’d like to sit back, relax, and let the computer do the work for you. The soundtrack is smooth, easy-listening music that sets a relaxing tone, adding to the feeling of a lazy summer day in the back yard, watching the dogs play on the lawn. Small animations, such as clouds moving behind the Bone symbols, add twinkle and charm to the production. The RTP is over 95%, which gives you a good chance of some wins, with the largest winning opportunity being a whopping 10,000 coins. Eyecon’s games always shine in their simplicity, and Doting Doggies is no different. Every aspect of this game is true-to-theme, and the layout and interface are easy-to-use. The graphics and animations enhance the gameplay without distracting from the important business of spinning and winning, and a generous jackpot makes it an exciting game to take for a walk. In short, this game is a slots fan’s best friend.